As of this week, Scopus has added 5 million pre-1996 records including over 93 million references to the database. This has been done in two ways: by adding pre-1996 cited references to existing articles in Scopus and by adding article back files, including their cited references, coming from archives from various publishers, going back to 1970. This milestone is the result of the ongoing Scopus Cited Reference Expansion Program initiated in March 2014 that aims to include cited references in Scopus going back to 1970 for pre-1996 content. The goal of this expansion program is to further enhance the ability for Scopus users to perform long-term, extensive bibliometric and historic trend analyses – and to enhance and further complete the h-index for researchers who published pre-1996. Recently a librarian posted to @Scopus on Twitter about gathering statistics on an author’s citation trends. Here’s a way you can use tools on the Scopus author profile page to determine which sources an author cites most frequently. Here you’ll not only see a list of the top sources the author references (and number of documents from each source), but you can also use the graph to view even more details, or create a chart in which you can compare journal metric values. We are happy to announce that the Scopus Conference Expansion Program (CEP) is now complete, exceeding its original goal with over 1,000 conference titles, 6,000 conference events and 400,000 conference papers newly covered in both Scopus and Ei Compendex. The Conference Expansion Program, which ran from 2011-2014, consistently focused on disciplines where the communication of findings at international meetings is especially important, primarily Computer Science and Engineering, boosting the citation levels of researchers in these fields. 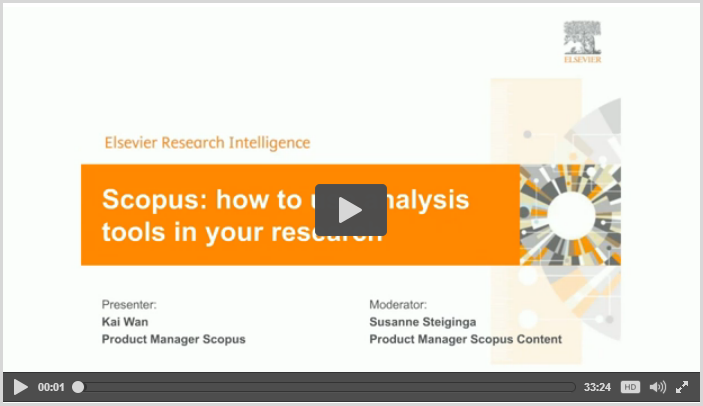 Conference coverage currently represents around 15% of the content loaded in Scopus, where it provides an important additional component to the scientific literature. Besides filling gaps in the coverage of conference-oriented disciplines, the influx of CEP coverage helps users to monitor the emergence of new concepts in other subject areas, tracking their passage into formal research papers. In March, we launched the Cited Reference Expansion Program to include cited references in the Scopus database going back to 1970 for pre-1996 content. Our goal is to expand the ability for users to perform long-term, extensive bibliometric and historic trend analyses – and enhance h-indices for those researchers who published pre-1996. As of November 1st we started re-indexing content and pre-1996 archives with cited references are now loaded on a daily basis. There are currently 500,000+ pre-1996 items with cited references in Scopus. This is having a positive impact on the h-index of senior researchers, making author profiles and h-index counts for these researchers more accurate and complete. To illustrate this content improvement, we have been tracking the number of total citations and measuring the difference of the h-index for a sample set of authors from various subject areas between June and December. Since its launch in the fall of 2004, Scopus has established itself as the largest abstract and citation database of peer-reviewed research literature. In honor of the 10th anniversary of Elsevier’s bibliographical database, Research Trends recently published a Special Issue that looks back on these 10 years and illustrates how Scopus can be used in bibliometric studies of trends in the global science system. Molecular Biology and Evolution, Vol. 24, No. 8, pp. 1596-1599. The Scopus Cited Reference Expansion, announced in March, is well on its way. Our October 23 release saw the expansion of the h-index publication window to 1970. The previous publication window was from 1996 onwards. As a result, the Scopus Author Profile page may show an increase of the h-index count for some authors. These changes in the h-index count are also visible in the author profile in “Analyze author output” h-index and the Cited by (citations) tab. Moreover, it also expanded the publication window of the “Citation Overview” tool. Why was this done: The h-index timeframe has been lengthened to 1970 in preparation for the Cited References Expansion project. 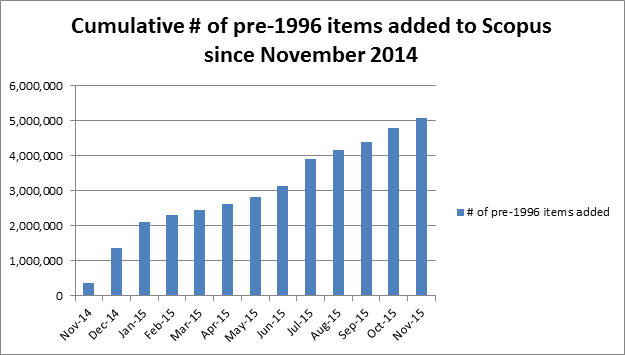 The first batch of pre-1996 cited references will start appearing in November.